Losing the elephant is like losing your imagination. Yet tragically this masterpiece of nature is on the brink of extinction due to massive habitat loss. In the past 100 years the Asian elephant population has plummeted by 90%. In another 30 years, it could easily vanish altogether. 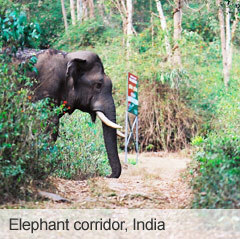 In today’s crowded world, there’s simply not enough room for the Asian elephant to roam safely. Our projects work with local communities to secure ‘Elephant Corridors’ – vital strips of habitat which reconnect Asian’s forests – the only way to save this iconic species from extinction in the wild. Find more information on these projects.